To Donate to the 2019 celebration now, click the button below. Many parents are needed to help make the night a success for our graduates! Seniors! 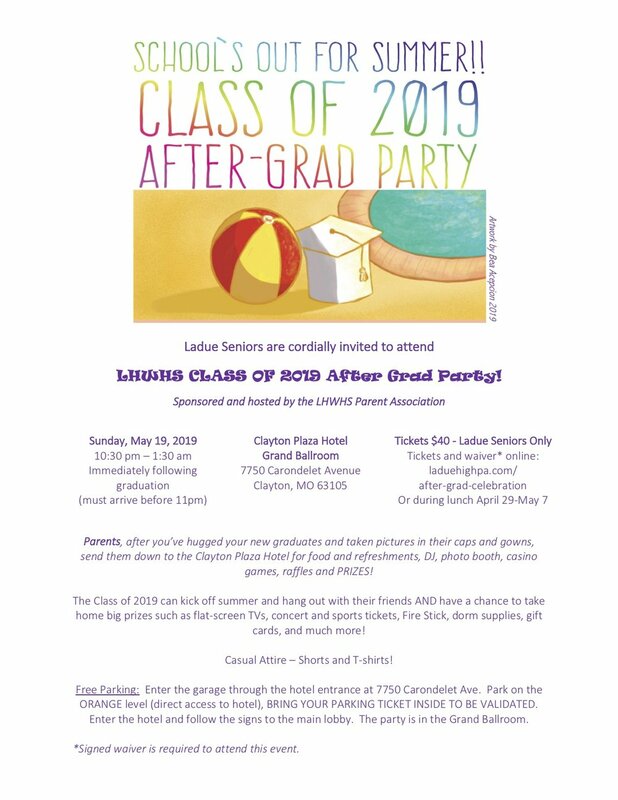 Sign up will start in April for our summer-themed After-Grad Celebration sponsored and hosted by the Ladue Horton Watkins High School Parents Association and Class of 2019 Parents. All LHWHS Class of 2019 Graduating Seniors – no guests, friends or family members. LHWHS 2019 Graduates only. Our Last Hurrah – complete with DJ, dancing, photo booth, food, refreshments, casino games, raffles and PRIZES! It’s a fun, safe way to celebrate with all your classmates without the influence of alcohol or drugs. Casual - shorts and T-shirts! Just yourself! And a smile. (Cellphones are okay). But no purses, bags, jackets, bottles, etc. will be allowed inside the event. There will be a supervised check-in area where you may store these belongings. Tickets are $40. Pay in April through My School Bucks (using the button below) or mail a check along with your signed waiver to Ladue Horton Watkins High School, Attn: After-Grad Party, 1201 South Warson, St. Louis, MO 63124. Each participant must submit a signed waiver before the event. Click on the button below. Return the waiver to the LHWHS Main Office by Wednesday, May 15 at 1:00pm. Enter the garage through the hotel entrance at 7750 Carondelet Avenue. Park on the ORANGE level (direct access to hotel). BRING YOUR PARKING TICKET INSIDE TO BE VALIDATED. Enter the hotel and follow the signs to the main lobby- the party is in the Grand Ballroom. Contact Parent Hosts Reagan Minkler (314) 494-3158 or Elizabeth Lochmoeller (314) 753-0044. If you'd like to make a donation to the After-Grad party, please click below.